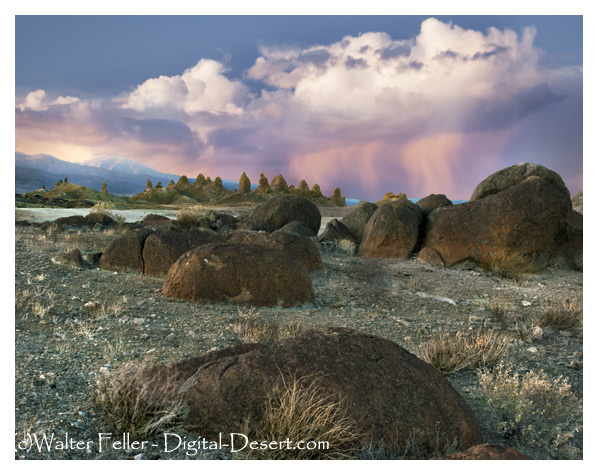 This eerie, fantastic landscape is one of the most unique geological features in the California desert. These other-worldly shapes are the Trona Pinnacles. Known as tufa pinnacles, these strange shapes formed underwater 10,000 to 100,000 years ago. This portion of Searles Dry Lakebed is the bottom of a long ago glacial lake. These over 500 pinnacles are composed or primarily of calcium carbonate with some blue-green algae thrown in. The pinnacles are at an elevation of 1800 feet above sea level in the western Mojave Desert, 18 miles from Death Valley National Park. The Slate Range is to the east. The city of Trona is 10 miles to the north along the base of the Argus Range. During the Pleistocene Ice Ages, massive runoff spilled from the Sierra Nevada into a chain of "inland seas." This system of interconnected lakes stretched from Mono Lake to Death Valley and included Searles Lake. Deep beneath Searles Lake, calcium-rich groundwater and alkaline lake water combined to grow tufa formations. Today you see the rare aftermath of these perfect geological conditions. You can walk right up to the pinnacles, which stand up to 140 feet tall and 40 feet wide. 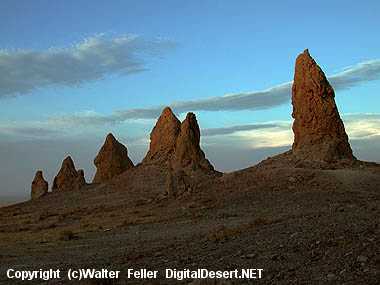 The Trona Pinnacles did not form all at the same time. The pinnacles are divided by age and elevation into three groups. The groups are dubbed the northern, middle and southern groups because they formed during three ice ages. The northern group is the youngest at about 10,000 - 25,000 years old. These are the These are the best examples of what are known as tufa towers. The northern youngsters also include shapes called tombstones, ridges, and cones. Close cousins to the northern group, the small middle group claims only about 100 spires, but boasts the tallest "tower," rising 140 feet. The granddaddy of them all, the southern group, includes roughly 200 tufa formations aged 32,000 to 100,000 years old. People have historically given names to the strange forms. 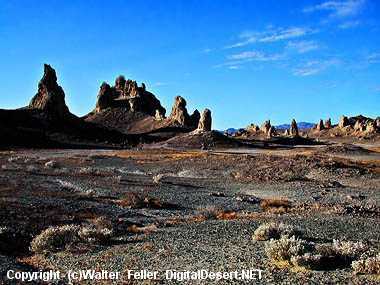 These ancient spires were once dubbed "Cathedral City". Geologically, the pinnacles are classified into four general shapes. Towers are taller than they are wide and rise 30 to 40 feet. Tombstones are stubby and squat and rise 20 to 30 feet. Most tombstones are in the northern-most tufa formations. Ridges are massive toothy tufa ruins. 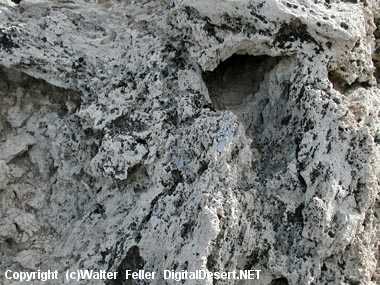 Trona has three ridges, one in the northern tufa cluster and two in the middle group. One ridge is 800 feet long and 500 feet wide and 140 feet tall. Cones are less than 10 feet tall. Dumpy and mounded, cone shapes lay scattered throughout the Trona Pinnacles. The Trona Pinnacles were designated as a National Natural Landmark by the U.S. Department of the Interior in 1968 to preserve one of North America's most outstanding examples of tufa tower formation. Items such as large, ancient spear points and atlatls (throwing sticks) suggest that humans have been here from at least 8,000 - 10,000 years ago. Bones from both the wooly mammoth and camel have been found around Searles Lake possibly indicating that early humans used the site for hunting and processing of food. Desert life is brutal. Organisms must endure temperatures above 115F amd survive with under three inches of rainfall a year. 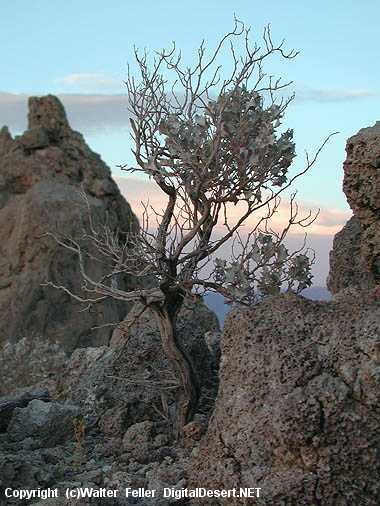 Plants such as the Desert Holly, a salt bush, clings to the basin soils. Lichen creep along some of the pinnacles. The tufa towers can also shelter nesting prairie falcons and ravens. Kit fox, coyotes, kangaroo rats, desert iguanas, horned lizards, and sidewinder rattlesnakes live in the sandy washes.